The Carus-Verlag team wishes you a successful, happy and healthy 2018! We ended 2017 on a high note with the launch of the Bach vocal Complete Edition in the Bach Archive in Leipzig. In 2018 we are focussing on two anniversaries in particular – the 200th anniversary of Charles Gounod's birth, and the 150th anniversary of Gioachino Rossini's death. With our new edition of Gounod's Messe solennelle de Sainte Cécile and Rossini's Stabat Mater and Petite Messe solennelle you will be able to recommend these great works to your choral directors and singers. The full performance material is available for anniversary concerts. Aside from composer anniversaries, there is a wide variety of new publications from Carus in the first half of the year! In our spring publications preview we present new publications for the coming months. Have a look through these! We wish you much enjoyment in browsing and making discoveries. We celebrate the 200th anniversary of Charles Gounod's birth in 2018! If we take stock of the French Romantic composer's sacred choral works, it is the tremendous variety of his output which impresses. 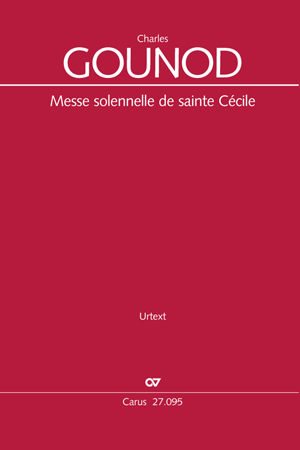 The latest work by Gounod published by Carus is the popular Messe solennelle de sainte Cécile . In his mass Gounod combines sublime simplicity with operatic-dramatic elements and a colorful, effective orchestration. Critical edition in proven Carus quality. Although first and foremost considered an opera composer, the Italian Gioachino Rossini produced an extensive range of piano and chamber music as well as sacred and secular vocal music. The latter is an integral part of the Carus publishing program. Wellknown are the Stabat Mater and the Petite Messe solennelle. 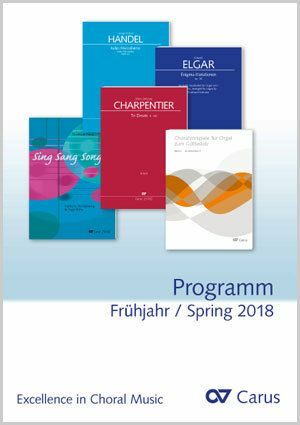 Both works are also available in carus music, the choir app, and the Petite Messe solennelle is also available as a Vocal score XL in reader-friendly large print and in the practice CD series Carus Choir Coach. 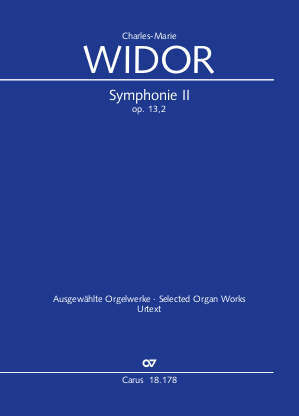 The series A makes a representative selection of the great symphonic organ works of Widor available for the first time in modern Urtext edition. Newly released this month is the second Organ Symphony. We are delighted to present our new publications for spring 2018 to you. Let yourself be inspired by browsing through our new editions of symphonic choral works, music for organ or music for church services. Download the program preview (PDF) >> here . 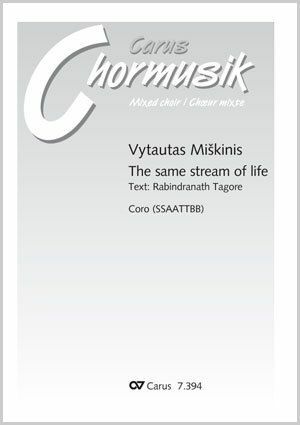 This month we are presenting several new publications of contemporary choral music, in particular several unaccompanied works by Vytautas Miškinis, as well as Harmonie du soir, the second song from Cinq Poèmes de Baudelaire by Claude Debussy arranged for choir by Clytus Gottwald. 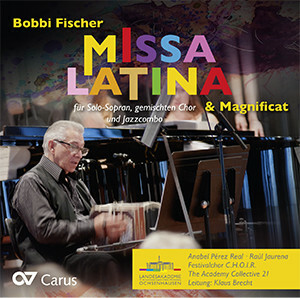 Bobbi Fischer's Missa latina is a colorful and highly spirited work. 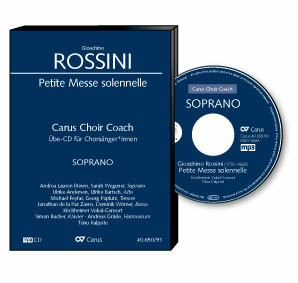 It is now available in a recording with the festival choir C.H.O.I.R. and Academy Collective 21, an ensemble which includes the composer himself, conducted by Klaus Brecht. The music for Missa latina is of course available from us, together with the complete performance material. 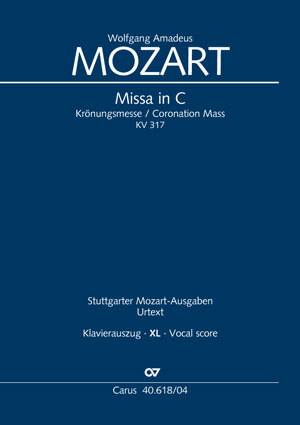 Mozart's Mass in C major K. 317, erroneously dubbed the “Coronation Mass,” is among the most popular and most often performed works in this genre. The complete performance material is available on sale, included the new Vocal score XL in large print. With Vocal scores XL we are offering important choral works in reader-friendly large print. Vocal scores XL will help all choral singers who soon find reading small-sized notes and text tiring, and will contribute to relaxed singing. 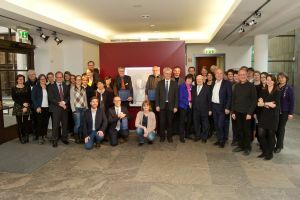 A full house for Bach: many of those involved in the Bach vocal Complete Edition project were present at the launch in the Bach Archive Leipzig on 9.12.2017. And so an "incredible project" is complete! Now all the motets, masses, Passions and oratorios, and a good 200 sacred cantatas by J.S. Bach, the famous Kantor of St. Thomas's, are available in modern Urtext editions, together with performance material for choir and orchestra. Congratulations! 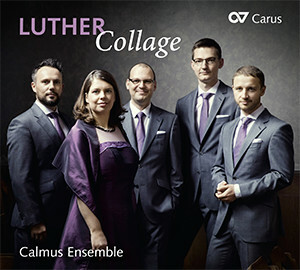 The CD LUTHER Collage by Calmus Ensemble has been listed by The New York Times as one of "The 25 Best Classical Music Recordings of 2017". Calmus has assembled collages out of the diverse Luther hymns. These chorale motets lead from the Middle Ages via the Renaissance and the Romantic period into the Modern age and illuminate the hymns from the most diverse viewpoints. Amongst Rheinberger's 14 mass settings, the Mass in E flat major op. 109 ( Cantus Missae ) composed in 1878 undoubtedly holds a special position. This mass must, in the opinion of Tristan Meister, count as one of the most important church music compositions of the Romantic period and is worthy of a place in the repertoire of every ambitious choir.